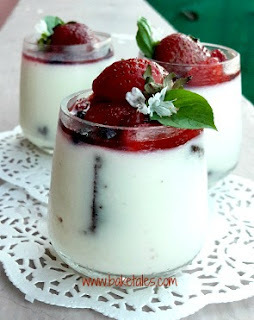 Birthday blog and a brownie white chocolate pannacotta recipe! Four years of Baketales! Four fabulous years! Isn't it fun to celebrate a milestone? There's cake ... err... brownies... and chocolate and a lot of good wishes blowin' in. Thanks folks, I feel your love so do keep them comin'...! Summer's back in Chennai and there are times when you crave a cold set dessert. For me, pannacotta is always the answer and the easiest thing to make. So I decided to put a bit of a baketales spin to it. I had some brownies sandwiched with strawberry jam. You could do it without the brownie but I think a little texture in the super smooth pannacotta is fabulous. Even more fab is if that brownie has some nuts in it. Slice the brownies into small batons and line the glasses with them. Pour over the prepared pannacotta and leave to set in the fridge. 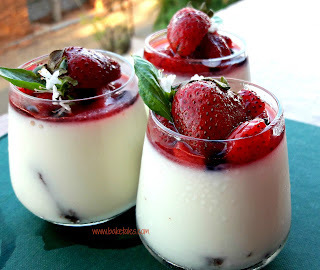 When set, top with stewed strawberries. That's it! If you'd like to make it extra special, stir a couple of tablespoons of strawberry liqueur through those stewed berries. Be warned - this recipe will be enough for only 6 shot glasses so if you want more, double or even triple the recipe. You could, of course, demould them and arrange the stewed strawberries over but but why meddle with something perfect?? Put cream and sugar in a saucepan. Place on medium heat, bring to just under boiling point. Remove from heat immediately and stir in white chocolate and gelatin. Stir till smooth, strain through a sieve. Leave aside to cool to room temperature. In the meanwhile, arrange brownie batons at the bottom of 6 shot glasses. 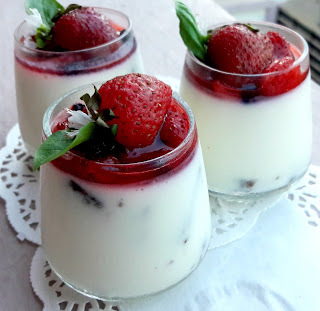 Pour the pannacotta over and leave to set in the fridge for 3-4 hours. 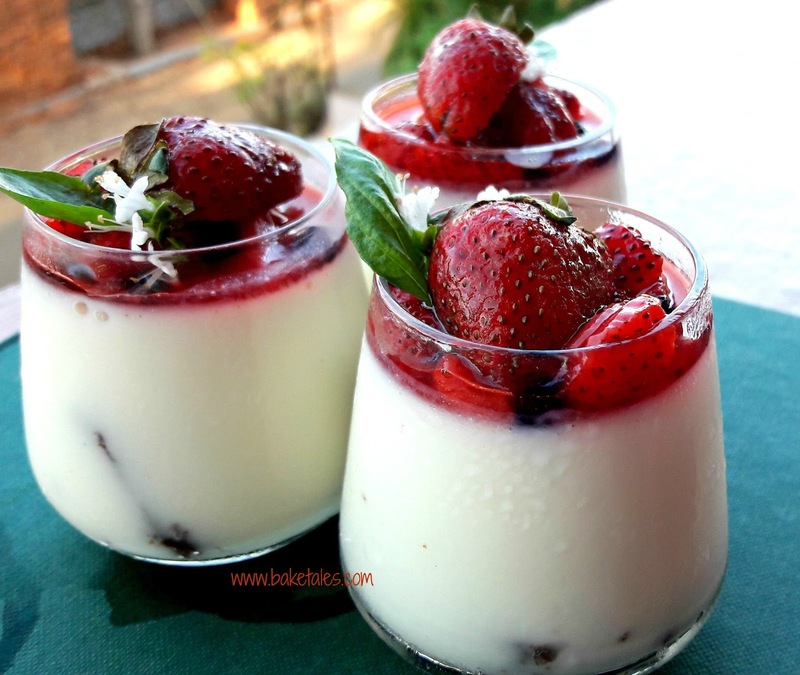 Decorate with stewed and halved strawberries. To stew strawberries, slice 8-10 strawberries into quarters. Sprinkle over 1 tablespoon sugar, leave for about 10 minutes. Warm the berries over a gentle heat till it just about begins to come to a boil. Remove from heat, leave to cool to room temperature. 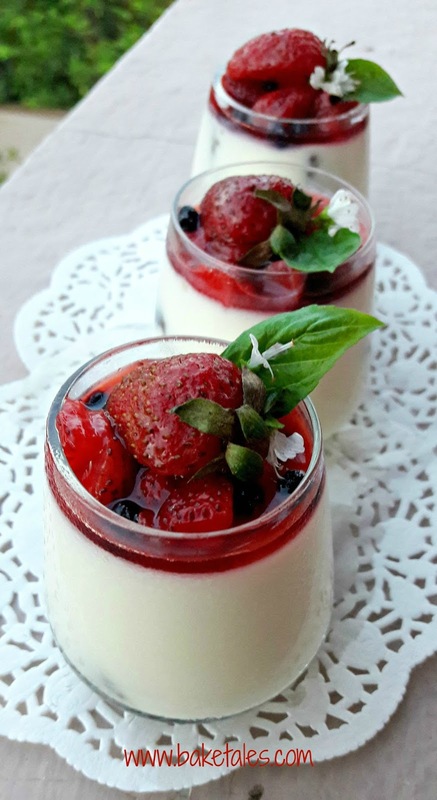 Divide the stewed berries over the pannacotta and top with the halved fruit. PS. Do let me know how yours turned out!